We’re excited to announce that the 2017 Community Checkup report is now available! The report was released at our All-Alliance meeting yesterday and the results are now live at www.wacommunitycheckup.org. The 2017 Community Checkup report compares clinics, medical groups, hospitals, counties and Accountable Communities of Health on common types of quality care, such as preventive screenings and care for chronic conditions. 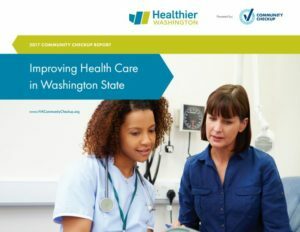 This report marks the third time the Washington Health Alliance has reported results for the Washington State Common Measure Set for Health Care Quality and Cost. The Alliance’s Executive Director Nancy Giunto shared some of the Alliance’s accomplishments from 2017 and looked ahead to some exciting reports coming early in 2018. Deputy Director Susie Dade gave an overview of the Community Checkup results and the state of health care in Washington. Dan Lessler and Lou McDermott of the Health Care Authority spoke about the need to get health care quality data into the hands of consumers and help them learn how to use it. Gary Kaplan of Virginia Mason spoke about the hard work of making performance improvement a reality and how to take action with data. Thank you to all of our members and partners who play such an important role in producing the Community Checkup. The Community Checkup earned Washington state an “A” for health care quality reporting in this year’s Price Transparency & Physician Quality Report Card. As Susie Dade said during the All-Alliance meeting yesterday, “Quality care is a problem for our state, but it’s our problem to fix. The great news is we have the privilege of living in a state with innovative people where collaboration is the hallmark of professional interaction.” We thank you for your support and look forward to an exciting and productive 2018!